readjustment can only be done on the side opposite to the sprocket. The fixed cone on the sprocket side must never be slackened. and tighten the lock nut ( 1 ) slightly until there is no more clearance of the spindle. and tighten the lock nut ( 2 ) well against it. You dont need a Fichtel-Sachs-Spanner. Use alternativ a "hook spanner with nose end" DIN 1810A. Open the hub, service the axle / spindle. Open the hub from the brakeside. Slacken the counter-nuts from each other and take both from the axle. The lever cone (Ill. No. 9 of the spare parts list ) can now be lifted off with the brake arm and dust cover. Now take the complete hub in you hand. Pull the axle at the driving side out of the hub. Do not dismantling the complete hub. The left spindle up is garbage. But not the cone! The spindle at the middle is "second hand" and in good conditions. Apply grease to the spindle like at the right side. Push the spindle into the hub and finish the work. 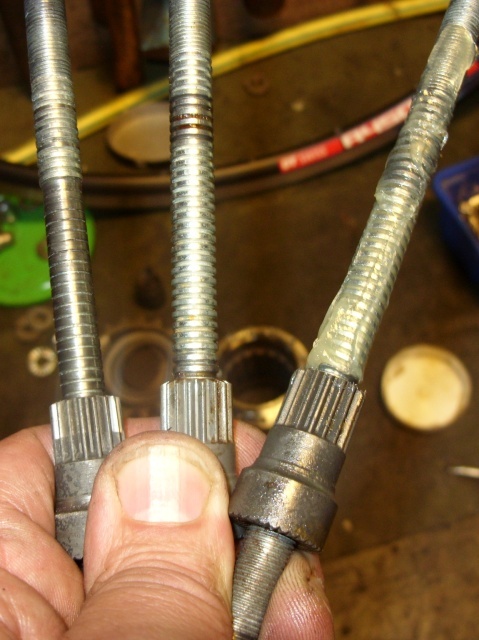 Read up "readjusting the bearings".